The first service of the Evangelical Mission Covenant Church was held June 18, 1872, in the home of Mr. and Mrs. J.C. Hurtie, two miles north and one-fourth mile east of the present church when J. C. Hurtie read a sermon and Klause Anderson led the singing. Mr. Hurtie and C. A. Swanson were the first leaders of the services when no pastors were present. Meetings were held in various homes. The Farrar schoolhouse and the Backman School, later called Victory School, were meeting places from 1880-1889. In 1880 the Christmas service (Julotta) was held at Victory School when a peach tree was decorated with cotton and candles. Through the leadership of Rev. Wm. Person and seven believers, the church was organized in 1880. He preached the first Sunday of every month, coming by horse and buggy from Randolph. He received $75 a year. The first resident pastor, Rev. P. W. Thoren, came in 1881. The constitution was adopted December 29, 1886, with 17 members. The name Swedish Evangelical Zion Mission Church was chosen at the meeting. 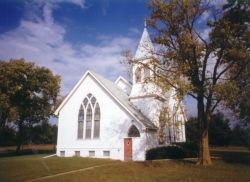 The first church was built in 1889, one mile north and three- eighths mile west of the present church. Rev. S. Arnquist was the pastor. Rev. J. Wm. Johnson became pastor in 1907. It was decided to build a new church at the present location. Lumber from the old church was used in the new building. When the roof was ready to be put on, fire started in the shavings, completely destroying the building in the presence of the contractors and carpenters. The members immediately began rebuilding. A parsonage, barn and other buildings were erected the same year. A large number of pastors have served the church. Some of the more recent pastors were G. 0. Johnson, Warren Jones, Andrew Magnuson, Eugene Bishop, Edgar Lindstrom, Robert Boyle, Ray Kapp, Larry Woodward, D. Elroy Anderson, Nick Gurnsey, Arne Mars, Carold Anderson, Floyd Richardson and Ray Bishop. Pastor Herb Schrader presently serves the church. Several members have become missionaries. Charlotte Swanson was a missionary to India and is buried there. Ruth Kasper was a missionary in the Covenant Mountain Mission and Nina Leonard was an associate missionary with Cadence International in Germany. Short-term missionaries were Mike and Susan Brown and Ray Bishop to Haiti. The Sunday School began in 1880 and continues today with classes for all ages. The Ladies Aid was organized in 1885 and later became the Covenant Women. They assist in the local church work and serve in the needs of home and world missions. The youth group was organized July 26, 1888. The church is affiliated with the Evangelical Covenant Church of America.